An entrepreneur has launched an online chat platform where users pay $0.01 (£0.0075) per character for the messages they share with the community. Marc Köhlbrugge described the service as a social experiment. At time of writing there are about 100 people using it and $335 has been spent so far. Most of the messages appear to be in Russian. There are also a few calling for subscribers to PewdiePie’s YouTube channel in an ongoing ratings battle. The site adds up the cost of the message as it is typed and card details are required before it is posted. There does not appear to be any moderation and some of the links being shared look like spam. 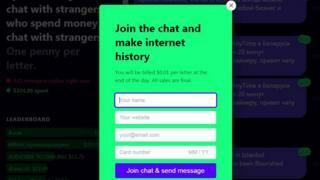 Mr Köhlbrugge told the website Motherboard that he had initially created Expensive Chat “as a fun way to make some extra money” and he intended to keep the cash spent by users himself. However, he added that he thought the product had potential for celebrities and influencers to host chats with the money going to charity. Mr Köhlbrugge has also tweeted PayPal creator Elon Musk to ask if he would like to “join the chat” and split the profits. Currently most online message boards are free to post on and while some sites may charge subscriptions, the length of the message is not a factor in the cost. Kate Bevan, editor of Which? Computing magazine, said she thought the idea was interesting. “I can see how it could be turned into a useful tool for a number of people and businesses looking to monetise their content,” she told BBC News.